Coasteering the WILD ATLANTIC WAY , how do I do that?? This WILD ATLANTIC WAY adventure journey involves a combination of adventure swimming through some of natures wonders such as sea caves, blow holes and sea arches. Get the chance to jump and dive off rocky out crops and the various sea cliffs encountered to explore the huge variety of sea life along your safely guided adventure journey. It’s the perfect activity if the surf goes flat! Come and learn about sea-weeds while traversing the Garrettstown Coastline in this new high octane activity and identify the coastlines creepy crawlies! Test your adventure swimming skills as you explore the wonders of the waves swishing you about through the caves along the way and scramble for the heights only to leap off again! Coasteering can be as adventurous and/or as educational as you want it to be. We can make it as mildly or adventurously exciting as you wish and what ever happens, we ensure your safety, enjoyment and learn something new each time. This trip is priced at €40 pp. Meet us on Garrettstown beach where we will explore the local coastline from the beach. Jump into some of our splash pools and feel the mild swell wash the cob webs away! Check out the 'Devils Hole' at the end of 'No Light Tunnel' and explore 'Rocky Bay' having swum through the 'Blue Arch'. 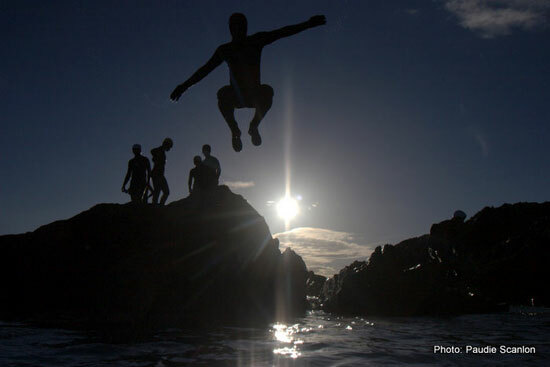 Chance a leap of faith off 'Shark Rock' and splash every one of your friends! We will guide you along the whole way and teach you the variety of flora and fauna encountered. Open your eyes and mouth over 'Moon Hole' where a wave will power up and blow your mind away! The Old Head of Kinsale is home to some of widest variety of Sea Birds seen in Ireland. Come and see the Fulmars, Razorbills, Gannets and Kittiwakes as well as the variety of Gulls. From our side - Your adventure guide is a fully qualified Beach lifeguards/Experienced Coasteering Guides,trained by/with the Irish Association of Coasteering Professionals, equipped with a water tight back pack with the necessary safety equipment . We will give you a buoyancy aid and helmet before you advance on your adventure trip along the coast. From your side – You will be exploring the coastline which means you will be getting wet thus needing a level of water confidence. You don't need to be an Olympic swimmer but we do want you to be competent enough to make your way through some of the rock pools and arches that you encounter. So have we sold it to you?! Thought so... Now, what do you need to do?! Gather up a towel, swimming togs, an old pair of runners and old pair of shorts that you can wear over the wet-suit.